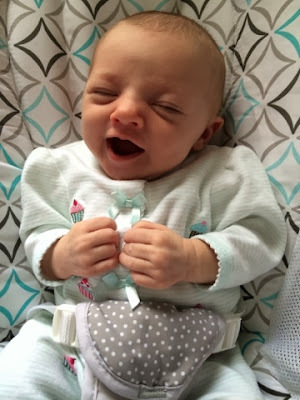 Is it just me, or does she keep getting cuter and cuter as the time goes on?! Which excited me more than her. I also discovered my child could potentially be a rap superstar. 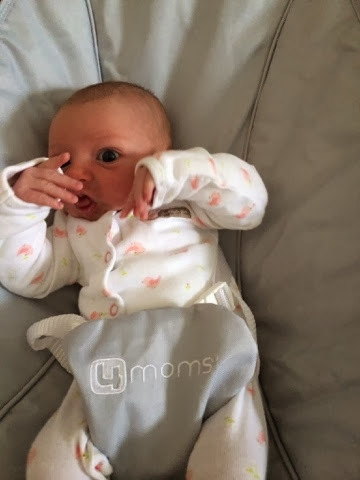 She was just about to bust out some rhymes in the Mamaroo...Yo yo yo! Tuesday, we had our first girls' lunch with Auntie Kaffy at Dean and Deluca. 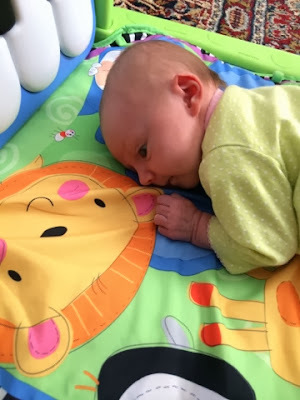 We also introduced Ella (finally!) to the pacifier, specifically the Wubbanub. Best thing ever. Moms to be...get yourself several of these things! Tuesday night, someone slept from 11:30pm until 6:30am! Pretty sure that qualifies as sleeping through the night! We were all so happy on Wednesday!!! Wednesday night, Ella got her first manicure (by Travis...I was too scared). 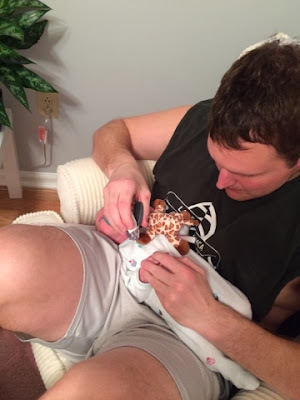 He accidentally clipped part of her skin and felt terrible! She was upset, but it's healing fine now. We are now both terrified to cut her nails...any suggestions?! 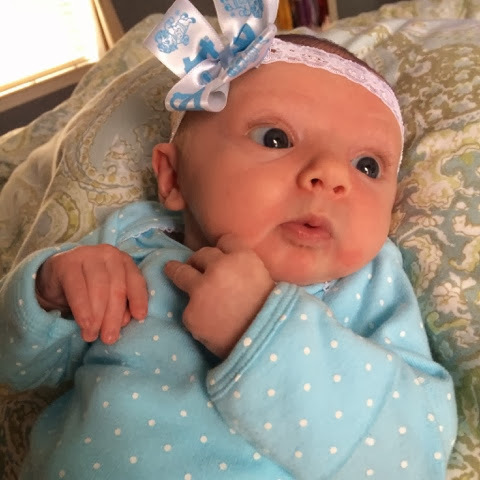 Thursday was Ella's first UNC vs Duke game...unfortunately she doesn't quite fit into any of the Carolina outfits in her closet, so we had to make do with a Carolina blue onesie. And then take 85 pictures of her with her UNC bow. 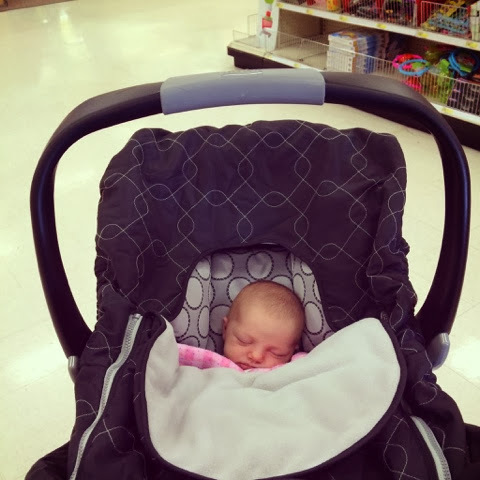 My parents came Thursday night, and on Friday, we took Ella to the mall for the first time. 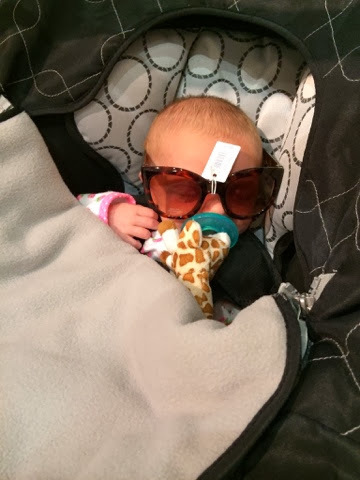 Of course, we had to buy her those sunglasses! 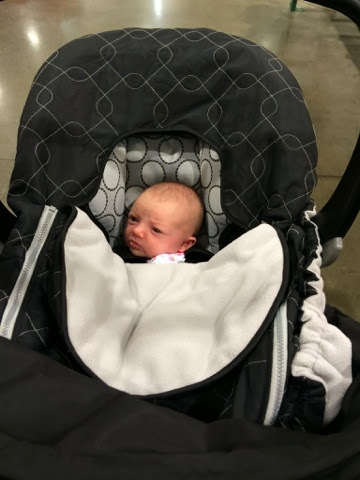 She also had her first trip to Costco! Friday night, her cord stump finally fell off (and I cried), so we could give her her first real bath!! 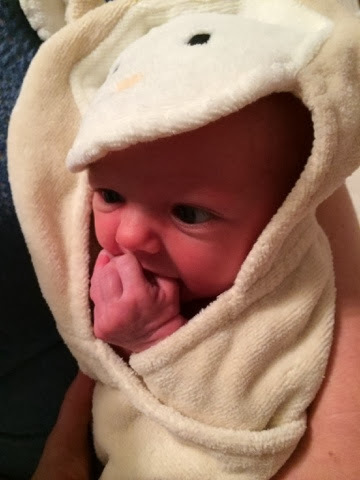 And afterwards, decided to poop all over this cute lamb towel. 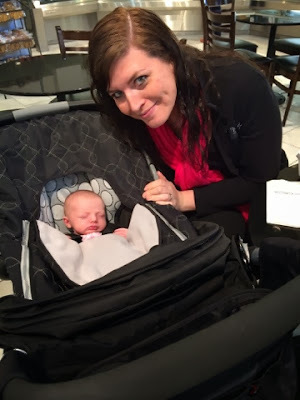 Saturday, Ella had her first restaurant experience at my distant cousins' retirement community! All of the old people loved her!! Sunday, we started doing tummy time. Which Ella just kinda lays there. But I guess that's all they are supposed to do at this stage?! We also started reading some books....I really hope Ella can get her act together and like to read, because so far, she is NOT interested. It's like I'm back in the classroom, haha! 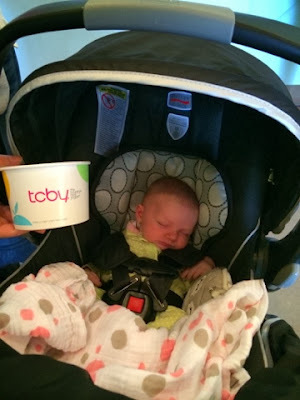 We also took a walk up to TCBY with Kathryn for some froyo! This is all just going by wayyy too fast! 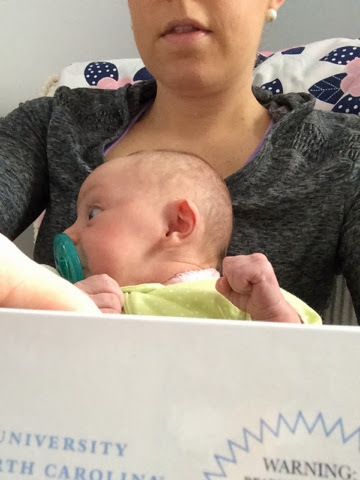 I can't believe next week she will be a whole month old!!! how little and sweet! 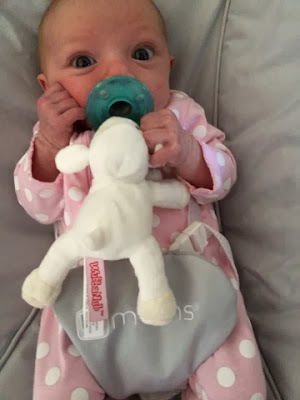 Shelby didn't take a paci and we were given 2 Wububnubs! So much to love about this post - those sunglasses, her rapping and of course her UNC bow!!! She must be good luck!! And yay for sleeping through the night!!! You're really getting out and about a lot! That's awesome!